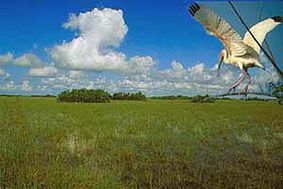 Everglades National Park Travel in a Luxury RV Motorhome to this national park in the state of Florida. The largest subtropical wilderness in the United States. Everglades National Park is a national park in the U.S. in the state of Florida. The largest subtropical wilderness in the United States, it contains the southern 25 percent of the original Everglades marshland region of southwestern Florida. It is visited by one million people each year, and it is the third-largest national park in the lower 48 states. It has been declared an International Biosphere Reserve, a World Heritage Site, and a Wetland of International Importance. Unlike most other U.S. national parks, Everglades National Park was created to protect a fragile ecosystem instead of safeguarding a geographic feature. Thirty-six species designated as threatened or protected live in the park, including the Florida panther, the American crocodile, and the West Indian manatee. Protecting the largest U.S. wilderness area east of the Mississippi River, the park is the most significant breeding ground for tropical wading birds in North America, and contains the largest mangrove ecosystem in the western hemisphere. More than 350 species of birds, 300 species of fresh and saltwater fish, 40 species of mammals, and 50 species of reptiles live within Everglades National Park of southern Florida's fresh water is recharged by the park, including that of the Biscayne Aquifer. The Everglades is a slow-moving system of rivers, flowing southwest at about 0.25 miles (0.40 km) per day, fed by the Kissimmee River and Lake Okeechobee. Although humans have lived in the Everglades for thousands of years, it was not until 1882 that the region began to be drained for agricultural or residential use, and the water flow from Lake Okeechobee was controlled, and diverted to the South Florida metropolitan area. The ecosystems in Everglades National Park have suffered significantly from human activity, and the repair and restoration of the Everglades is a politically charged issue in South Florida.